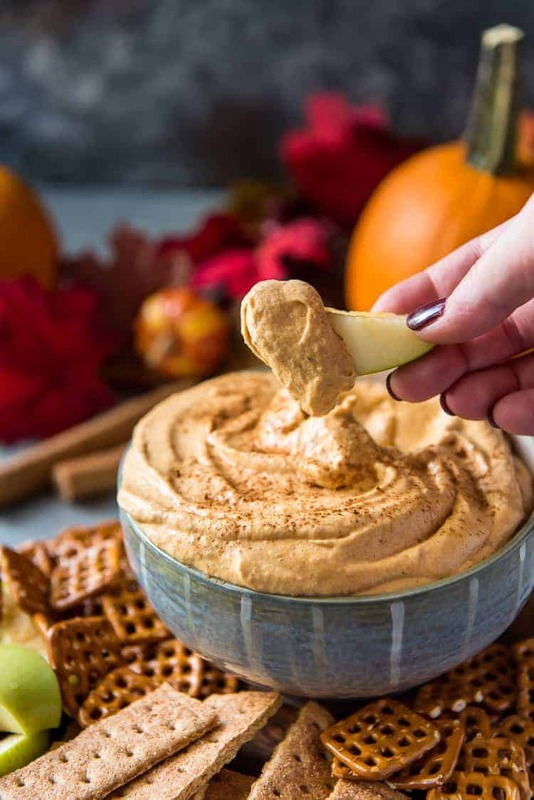 This Fluffy Pumpkin Cheesecake Dip is the quickest, easiest fall dessert imaginable! Canned (or fresh!) pumpkin puree, cream cheese, and whipped cream play big parts in bringing this scoopable, dippable treat to life – and it also doubles as a no-bake cheesecake filling! Guys, this pumpkin dip might just be the epitome of easy fall desserts. It’s about the best damn no-bake cheesecake filling I’ve ever had. Creamy, cheesy, slightly sweet , and pumpkiny to boot – it’s freakin’ excellent. And with only 5 ingredients inside, I’m expecting little complaining and lots of munching. 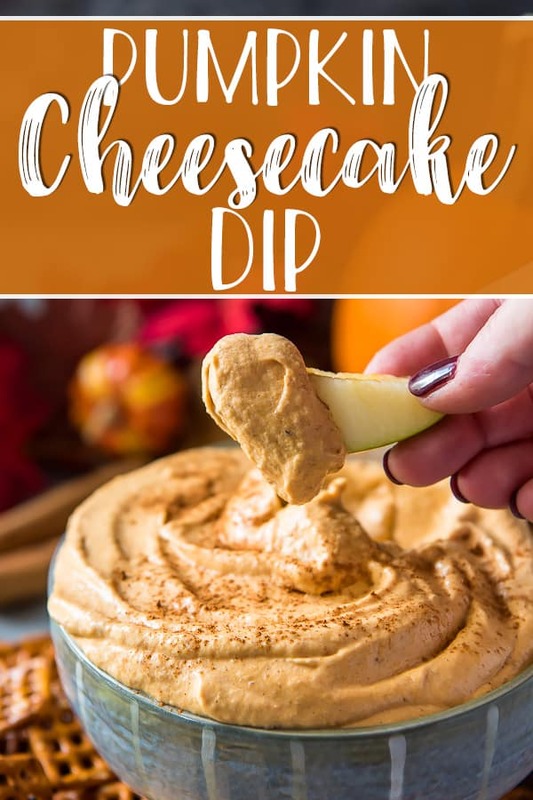 JUST TAKE ME TO THE PUMPKIN CHEESECAKE DIP ALREADY! If you’d rather skip my (pretty darn helpful) tips and tricks, essential cooking info, and similar recipe ideas – and get straight to this deliciously easy pumpkin dip recipe, just scroll right on down to the bottom of the page where you can find the printable recipe card! Of course, it wasn’t hard. It is SO delightfully fluffy. Before you know it, you’ll be staring at a bit of the bottom of the bowl. The good news? I repeat: it’s so easy! Just whip up another batch – just make it quick, because the other folks at the party will know it’s gone! First, soften a block of cream cheese at room temperature. If the cream cheese is too cold when mixing it into the dip, small flecks of unblended cream cheese will remain in the dip. Next, blend the soft cream cheese with brown sugar (for a bit of sweetness) until smooth and creamy. Feel free to adjust the sugar to your tastes. Then add the pumpkin puree and spice and mix until well combined. Then, in a separate bowl, whip some heavy cream to stiff peaks. Alternatively, you could use 1 1/2 cups of thawed store-bought whipped topping. Gently fold the whipped cream into the dip until it’s fully combined. 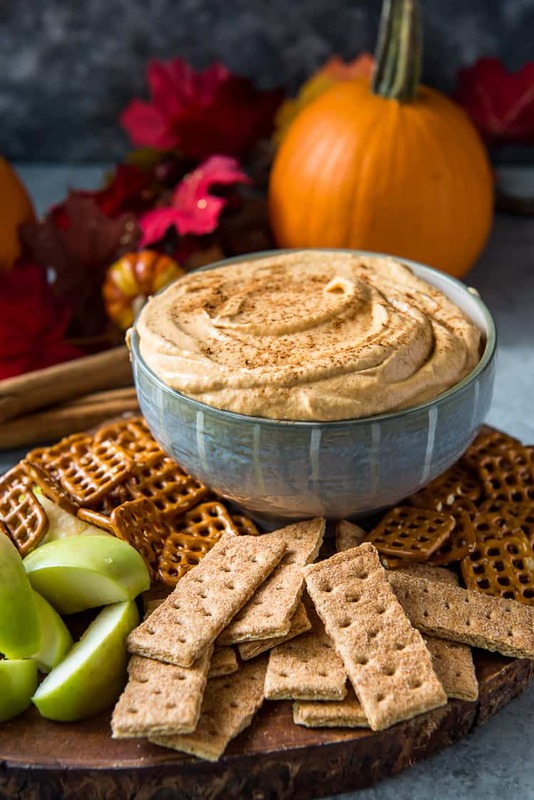 Refrigerate the pumpkin dip until you’re ready to serve it! 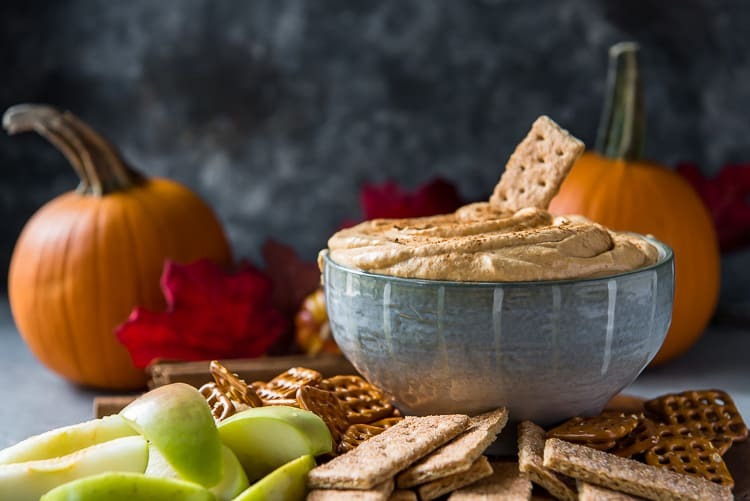 You could also use this pumpkin dip in brownie parfaits, pipe it into small tart shells, or spread it on top of a large baked graham cracker crust and serve it as a cheesecake. 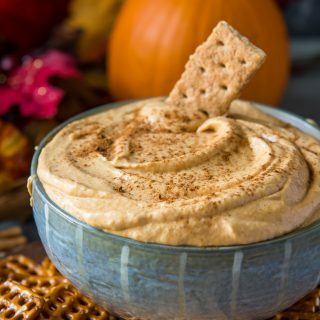 Can I Freeze Pumpkin Dip? Yes! Place it in a freezer-safe container or a zipper bag and freeze for up to 1 month. How Long is Pumpkin Dip Good For? This pumpkin cheesecake dip will stay fresh covered in the refrigerator for up to 5 days. Be sure to refrigerate it no more than 2 hours after putting it out to serve. What Goes With Pumpkin Dip? LOOKING FOR MORE FALL DIP RECIPES? 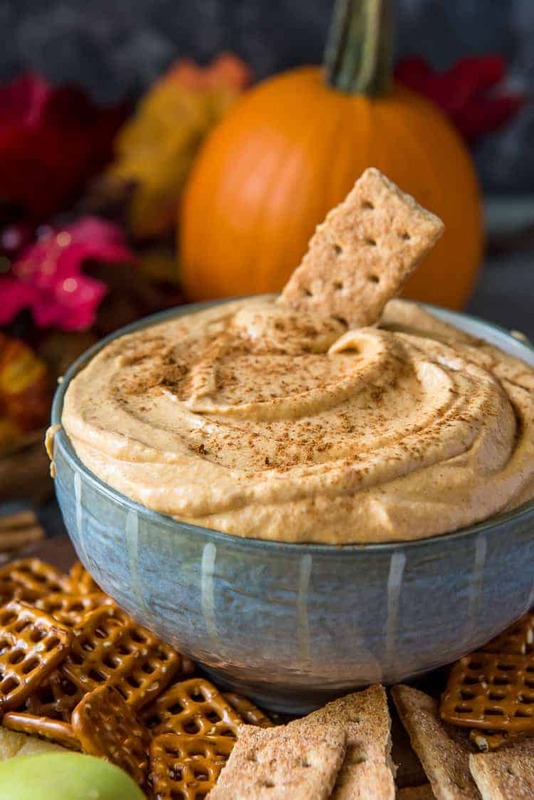 This Fluffy Pumpkin Cheesecake Dip is the quickest, easiest fall dessert imaginable! Canned (or fresh!) pumpkin puree, cream cheese, and whipped cream play big parts in bringing this scoopable, dippable treat to life - and it also doubles as a no-bake cheesecake filling! In a medium bowl, use a hand mixer to blend the cream cheese and brown sugar until smooth and creamy. Add the pumpkin puree and spice to the bowl, then blend again until well combined. In a separate cold bowl, whip the heavy cream to stiff peaks. Gently fold the whipped cream into the pumpkin dip until fully combined. Refrigerate until ready to serve, then sprinkle with ground cinnamon. Serve with choice of dippers, or use in a no-bake recipe. 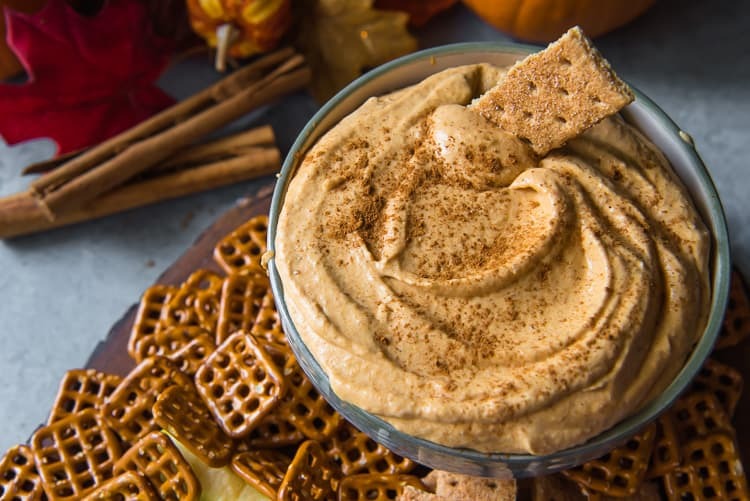 PIN THIS PUMPKIN DIP FOR LATER! Perfect for a tailgate or game day party.